Jakarta, September 11th 2015 – On September 7th 2015, Archipelago International and PT. 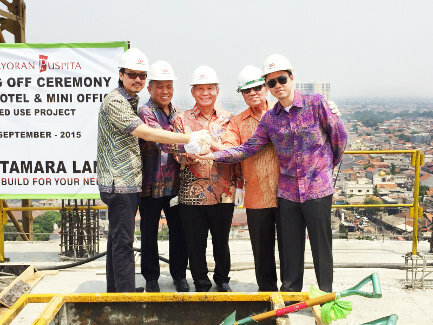 Kebayoran Puspita celebrated the final stage of construction for the upcoming Hotel NEO Kebayoran in Jakarta, set to be open in June 2016. The topping-off ceremony comes almost a year and a half after the initial groundbreaking, which was celebrated on March 3rd 2014. In partnership with Archipelago International, PT. Kebayoran Puspita also will launch NEO Kalideres next year in Jakarta, making the new NEO Kebayoran their first NEO project with a brand new 'condotel' concept, situated within the multifaceted Kebayoran Icon Building. 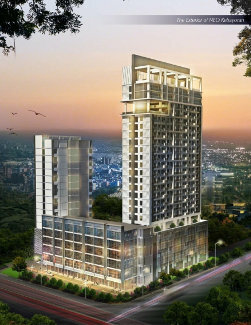 Located in South Jakarta, NEO Kebayoran sits perfectly opposite the Carrefour Express, five minutes from the Transjakarta Bus Shelter, fifteen minutes from the Cipulir Market, and close to a number of the city's high-end shopping districts including Gandaria City, Pondok Indah Mall, Senayan City, and Plaza Senayan. The hotel features 105 rooms across two different room categories, together with four meeting rooms for business guests, a signature coffee shop, stylish lobby area and spacious parking facilities for guests. "Hotel NEO is the second fastest growing economy class hotel brand in Indonesia, right after our favehotel brand. It already has an underlying portfolio of 23 hotels, out of which, 13 are operational and a further 10 under construction. NEO Kebayoran will be the fifth NEO in Jakarta and the second in partnership with with PT. Kebayoran Puspita. This success is a testament to the dynamic, up-to-the-minute nature of this contemporary brand which has become business travelers go to hotel across Indonesia." said Mr. Norbert Vas, Archipelago International's VP Business Development & Operations. Seen in the image : The exterior of Hotel NEO Kebayoran, Jakarta. Seen in the image : From left to right; Mr. Anthony Putihrai (CEO of Tamara Land/President Director of Kebayoran Puspita), Mr. Tony Amin (President Commissioner of Kebayoran Puspita), Mr. Bing Rahardjo (Commissioner of Kebayoran Puspita), Mr. Setyono Tedjo SH (Commissioner of Kebayoran Puspita), and Mr. Otto Putihrai (Director of Tamara Land/Director of Kebayoran Puspita).